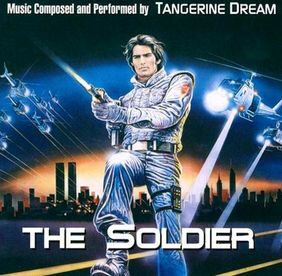 In 2014 a soundtrack album to the 1981 movie The Soldier appeared, once more originating from the alleged 'Orange Records' company who already had released a number of illegal TD soundtracks over the years. Since it is an pirate release it is mainly sold through auction portals via internet. Listeners were surprised by the excellent, crisp sound quality of the album -- so much different from previous bootleg efforts where the music was taken directly from the movie, including voices and noise. Only the very last track, being the music from the end titles, is really taken from the movie (though a much better, in fact excellent version directly taken from the soundboard is available from YouTube for free). The origin of another track could not yet be determined (track 27). The music collected here is similar (but not identical) to that used in the movie, hence the creators of this bootleg must have had some good knowledge of Tangerine Dream's vast music catalog to chose appropriate tracks. But given the fact that completely new track titles have been chosen, and the real origin of the material is not mentioned at all, The Soldier must be considered a complete rip-off, especially for those TD collectors who already own the albums mentioned above. Speaking of the track titles, the bootleggers appear to have some sense of humour, as a good part of the titles seems to be deliberately formed of alliterations: Berlin Bedtime Bond, Desert Detonation Device, Berlin Border Breach, Interception Incident, Russian Renegades Return etc., just to name a few. The booklet and insert are made quite professionally making it hard to identify this release as a bootleg.